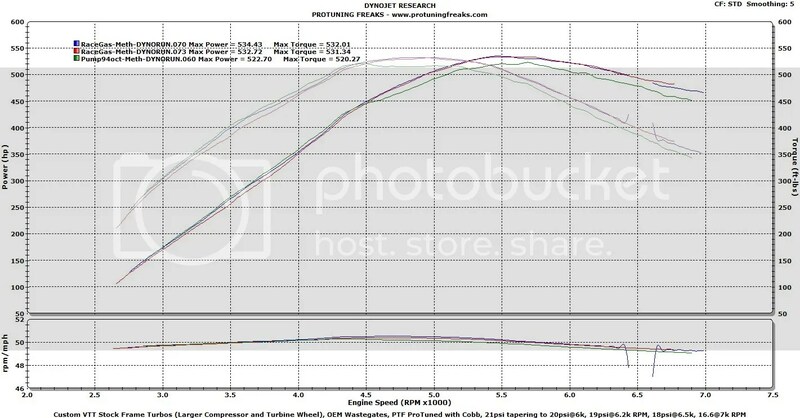 534WHP 532WTQ – One-off set of custom turbos from Vargas – Race Gas + Meth – New N54 Stock Frame Turbos/Stock Motor Record? We think so.. Went back to the dyno this past Saturday. It was a lot hotter out than last time when the car did 523whp on pump+meth. With the same conditions as on the pump/meth runs it could’ve maybe done a touch better, maybe 540 even, maybe not. It shows just how close meth/pump numbers can be to a more expensive race gas+meth alternative when you’re already maxed on the turbo side of things. However, with race gas some additional timing managed to be had without knock through the top end helping power not drop off as quickly in the 6-7k rpm range. These are the one-off set of stock frame upgraded turbos from Vargas. These will never see production and are not Stage 2 Batch 2 turbos. These have a one off housing that was used in the name of “science” to see the effects of a lot more machining work on the turbine housing when it comes to hp while preserving the OEM exhaust manifold in place. Both tunes run the same boost and wg duty cycles. Only thing remaining is to try maybe using an E85 blend with meth, possibly.